In the wake of recent terror attacks, all eyes are on the United States: How will the U.S. react? What will the nature of its response be? Will there be invasions and drone strikes, or negotiations and peace talks? Meanwhile, in the Middle East and on the Korean peninsula, a desire for peace and security has led to threats of war or preemptive strikes as well as intensive rounds of diplomatic negotiations. Newspapers, magazines, television sets, and the Internet provide Americans with the latest information as it becomes known. In this atmosphere more than ever, the need for an accessible, reliable reference to foreign policy is essential. Looking at American foreign policy from a historical viewpoint, Encyclopedia of American Foreign Policy, Second Edition details U.S. foreign affairs from the American Revolution up through the modern day. This comprehensive A-to-Z reference guide covers important people, groups and organizations, events, and legislation. It is the ideal place for students and general readers to start their research on America's relationship with the rest of the world. This eBook contains hundreds of accessible entries, each of which is clear and concise yet insightful, providing valuable information that gives readers the knowledge and context to understand U.S. foreign policy today. Glenn Hastedt received his Ph.D. from Indiana University and currently teaches at James Madison University. An expert in foreign affairs, his publications include American Foreign Policy: Past, Present, and Future. 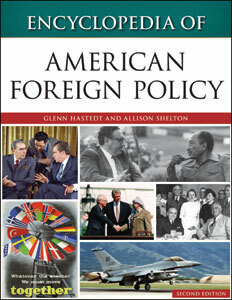 Allison Shelton is a Ph.D. candidate in the Department of International Affairs at the University of Georgia.